Recipe from Inés Barranca, Senior Creative Consultant, Hispanic Markets, American Greetings. 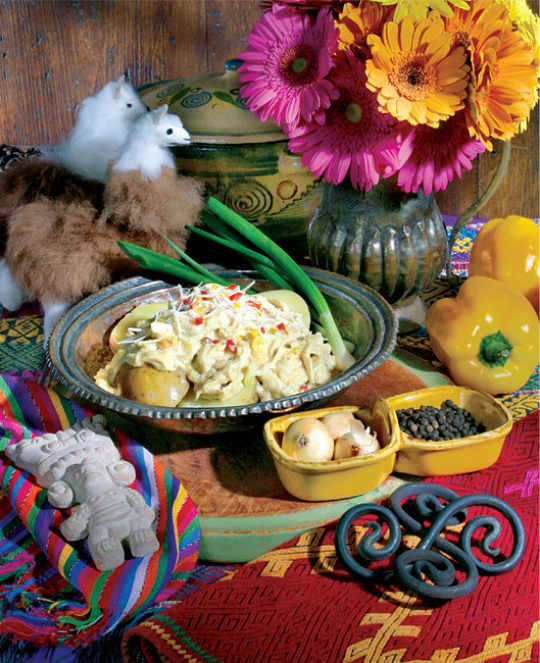 We've varied this traditional Peruvian recipe just slightly for a healthier meal. This one-of-a-kind recipe is an authentic treat your family will love! Boil chicken breasts in water in small pan, add a pinch of salt. When cooked, place chicken breasts aside and let them cool before shredding them. Do not discard chicken broth. Place bread in medium bowl, add milk and 1/2 cup chicken broth. Place in blender and blend on low speed until bread is the consistency of oatmeal. Add chicken broth or milk as necessary. In stewing pan, sauté onion, yellow pepper paste, minced garlic, black pepper, cumin and turmeric until onion is translucent. Immediately add the bread mixture, shredded chicken, peanut butter, salt and parmesan cheese. Stir until well blended. If mixture is too thick, add chicken broth. If you like it spicier, add yellow pepper paste. Serve hot over thick potato slices. May be served with long-grain white rice.